With school starting up and schedules becoming packed, many families return to familiar routines. For some, this can mean a routine of chaos. With school, extra-curricular activities, and sports, you and your family may find yourselves in a rush and begin neglecting the healthy lifestyle you were able to maintain with more ease during the summer months. 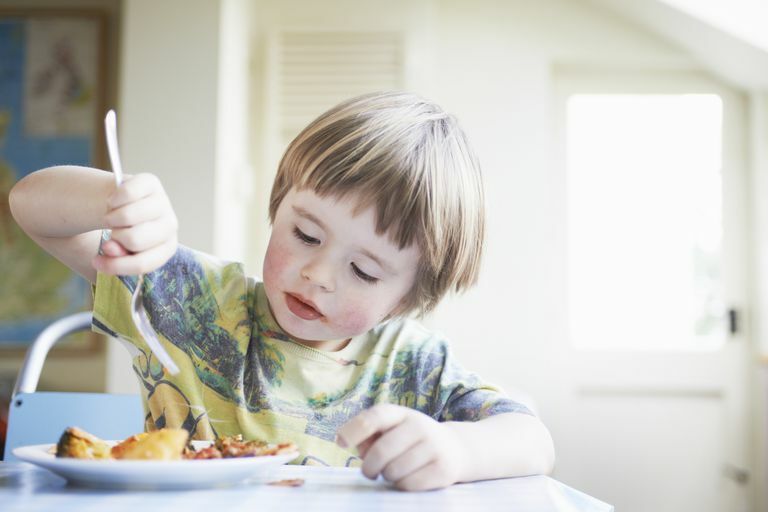 With everything you have going on, how do you keep an eye on your child’s nutrition? It’s no secret that adolescent and childhood obesity is a serious problem affecting our youth today. In fact, childhood obesity has more than tripled since the ‘70s. An NCHS Data Brief shows that 1 in every 5 school age children struggles with obesity. It is possible that obesity can be brought on by lack of guidance in nutrition, a fast-food lifestyle, and lack of exercise. So, what can you do to ensure the health of your child? One of the best things you can do for your child is to demonstrate and enforce a healthy lifestyle for the whole family. Meal times are a great place to start this positive change. A good idea would be to practice portion control and healthy choices during meals. A portion is the amount of food that ends up on the plate. Portions should be determined from the serving sizes on food labels. Serving sizes, however, are not always accurate to what you should be eating, but rather are a way to show nutritional information per a set amount for the food. It may be acceptable to have a larger portion of vegetables than the suggested serving size and not acceptableto have a larger portion of a processed food suggested by the label. USDA’s “MyPlate” is a great starting template for kids to learn portion control. MyPlate divides a plate into fourths. One fourth should be used for protein and another fourth should be used for starch or a whole grain. The remaining two can be filled with vegetables or a mix of veggies and fruit. It is very important that the sections aren’t spilling over into each other and are not piled high off the plate. MyPlate gives a good visual for what you should be eating as well as help in preparing healthy, well-balanced meals for your family. Although MyPlate is a good visual, many children as well as adults still struggle with understanding and visualizing recommended portion sizes. Eyeing a proper serving size without physically measuring it can be tricky. An easy way to help visualize portion sizes is by relating them to familiar objects. For an example, compare 2 tablespoons of peanut butter to the size of a ping-pong ball, 3 ounces of beef or chicken to a deck of cards, and 3 ounces of fish to a checkbook. This helps children and even adults understand what their plate should look like, and helps you know how much to cook and place on your family’s plates. More helpful comparisons can be found here. Here are some extra tips to help you and your children with practicing healthy portion control. Have three healthy meals each day with two healthy snacks in between.Avoid skipping a meal so you don’t overeat at the next meal, and don’t force yourself to eat if you don’t feel hungry. Don’t encourage a “happy plate.”Forcing children to finish their plate even if they feel full teaches them to ignore their body’s signals of hunger and fullness. Serve your meals on smaller plates.Smaller plates make the meal look much bigger and fulfilling than it would on a large plate with lots of space. Slow down at meal times. Rushing through meals causes you to eat too quickly and delays the feeling of fullness. This can cause you to eat more than intended. Keep the food off the table.Make your plates in the kitchen and take only your plates to the table. This will help you think twice about wanting seconds. If you notice your child has an exceptionally hard time eating proper portions and practicing a healthy lifestyle, don’t hesitate to consult any of us at the Association of Childcare Physicians. If you think your child may be on track to being overweight or obese, contact your physician before the situation progresses further. We would be happy to assist you in determining what a healthy weight for your child should be as well as giving recommendations on their diet and exercise. Call us at 618-235-2311.